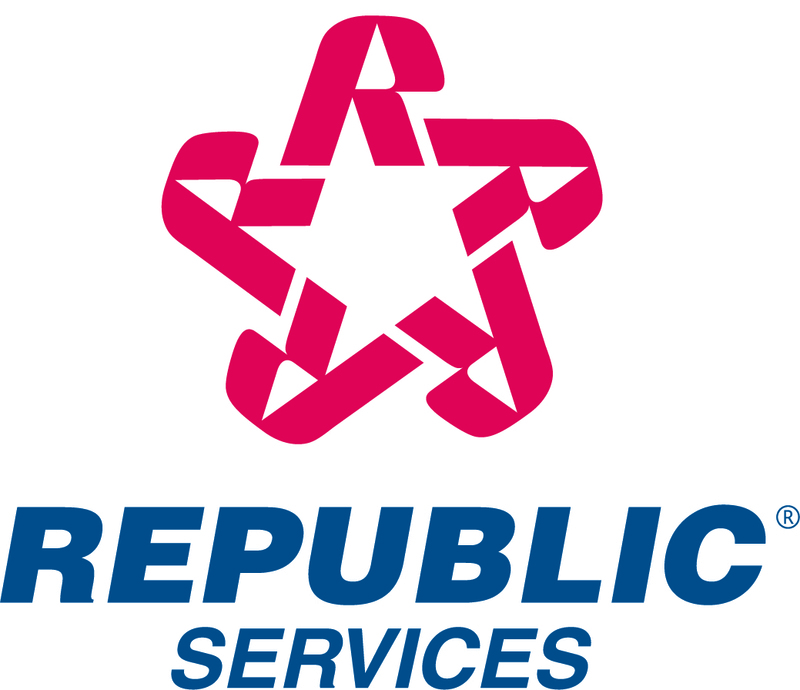 Republic Services, Inc. today reported that revenue for the three months ended March 31, 2004 increased 7.2 percent to $637.3 million compared to $594.6 million for the same period in 2003. The Company's internal growth during that period was 6.2%, with 2.9% from price and 3.3% from volume. Net income for the three months ended March 31, 2004 was $56.9 million, or $0.36 per diluted share, compared to $54.6 million, or $0.33 per diluted share, last year before the cumulative effect of changes in accounting principles. Operating income for the three months ended March 31, 2004 was $110.0 million compared to $105.4 million for the same period last year. Commenting on these results, James E. O'Connor, Chairman & Chief Executive Officer of Republic Services, said, "Republic Services is performing very well. I am pleased with the Company's success in implementing its pricing strategy in conjunction with our operating and cost initiatives. The Company has recorded its highest internal growth rate since 2000 and we are well-positioned to achieve our 2004 financial objectives." Certain statements and information included herein constitute "forward- looking statements" within the meaning of the Federal Private Securities Litigation Reform Act of 1995. Such forward-looking statements involve known and unknown risks, uncertainties and other factors which may cause the actual results, performance, or achievements of the Company to be materially different from any future results, performance, or achievements expressed or implied in or by such forward-looking statements. Such factors include, among other things, whether the Company's estimates and assumptions concerning its selected balance sheet accounts, final capping, closure, post-closure and remediation costs, available airspace, and projected costs and expenses related to the Company's landfills and property and equipment, and labor, fuel rates and economic and inflationary trends, turn out to be correct or appropriate, and various factors that will impact the actual business and financial performance of the Company such as competition and demand for services in the solid waste industry; the Company's ability to manage growth; compliance with, and future changes in, environmental regulations; the Company's ability to obtain approval from regulatory agencies in connection with expansions at the Company's landfills; the ability to obtain financing on acceptable terms to finance the Company's operations and growth strategy and for the Company to operate within the limitations imposed by financing arrangements; the ability of the Company to repurchase common stock at prices that are accretive to earnings per share; the Company's dependence on key personnel; general economic and market conditions including, but not limited to, inflation and changes in commodity pricing, fuel, labor and other variable costs that are generally not within the control of the Company; dependence on large, long-term collection contracts; dependence on acquisitions for growth; risks associated with undisclosed liabilities of acquired businesses; risks associated with pending legal proceedings; and other factors contained in the Company's filings with the Securities and Exchange Commission. The following information should be read in conjunction with the Company's audited Consolidated Financial Statements and notes thereto appearing in the Company's Form 10-K as of and for the year ended December 31, 2003. During the first quarter of 2003, the Company adopted Statement of Financial Accounting Standards No. 143, "Accounting for Asset Retirement Obligations" ("SFAS 143"). SFAS 143 required the Company to change the methodology it used to record closure and post-closure costs related to its landfills. Upon adopting SFAS 143, the Company no longer records closure and post-closure expense as a component of cost of operations. Instead, amortization expense is recorded on the capitalized portion of the obligation and accretion expense is recorded using the effective interest method. As of January 1, 2003, the Company recorded an after-tax expense of $20.8 million as a cumulative effect of a change in accounting principle resulting from the adoption of SFAS 143. In addition, the Company also recorded an after-tax expense of $17.0 million as a cumulative effect of a change in accounting principle relating to its accounting for methane gas collection systems. The Company believes that the presentation of operating income before depreciation, amortization, depletion and accretion is useful to investors because it provides important information concerning the Company's operating performance exclusive of certain non-cash costs. Although depreciation, amortization, depletion and accretion are considered operating costs in accordance with GAAP, they represent the allocation of non-cash costs associated with long-lived assets acquired or constructed in prior years. Operating income before depreciation, amortization, depletion and accretion also demonstrates the Company's ability to execute its financial strategy which includes reinvesting in existing capital assets to ensure a high level of customer service, investing in capital assets to facilitate growth in the Company's customer base and services provided, pursuing strategic acquisitions that augment the Company's existing business platform, repurchasing shares of common stock at prices that provide value to the Company's shareholders, paying cash dividends, maintaining the Company's investment grade rating and minimizing debt. During the three months ended March 31, 2004, cash provided by operating activities was $190.3 million, cash used in investing activities was $44.4 million and cash used in financing activities was $90.8 million. The Company believes that the presentation of free cash flow, which is a non-GAAP financial measure, provides useful information regarding the Company's recurring cash provided by operating activities after expenditures for property and equipment, net of proceeds from the sale of property and equipment. It also demonstrates the Company's ability to execute its financial strategy as previously discussed and is a key metric used by the Company to determine compensation. Free cash flow does not represent the Company's cash flow available for discretionary expenditures because it excludes certain expenditures that are required or that the Company has committed to such as debt service requirements and dividend payments. The Company's definition of free cash flow may not be comparable to similarly titled measures presented by other companies. Capital expenditures include $.4 million of capitalized interest for the three months ended March 31, 2004 and 2003, respectively. As of March 31, 2004, accounts receivable were $250.0 million, net of allowance for doubtful accounts of $17.7 million, resulting in days sales outstanding of approximately 35 (or 23 days net of deferred revenue). During the three months ended March 31, 2004, the Company paid approximately $93.1 million to repurchase 3.5 million shares of its stock. As of March 31, 2004, the Company had repurchased a total of 29.1 million shares of its stock for approximately $577.4 million. The Company is currently authorized to repurchase up to an additional $172.6 million under its repurchase program including the $75.0 million increase to the program approved by its Board of Directors in April 2004. In July 2003, the Company announced that its Board of Directors initiated a quarterly cash dividend of $.06 per share. In January 2004, the Company paid a dividend of $9.4 million to shareholders of record as of January 2, 2004. As of March 31, 2004, the Company recorded a dividend payable of approximately $9.3 million to shareholders of record at the close of business on April 1, 2004, which has been paid. In April 2004, the Company's Board of Directors declared a regular quarterly dividend of $.06 per share for shareholders of record on July 1, 2004. (a) Represents taxes levied on landfill volumes in certain states that are passed on to customers.